I had a Samsung Galaxy S3 which I used for some time. After getting a Galaxy S7, I transferred all my text messages and other stuff to the new phone using Smart Switch. However, last week I had to use the old phone again, and now I am wondering if there are any easy way to transfer the messages I send/received during that week to my new phone? Possibly, if there is a way of transferring the messages one at a time (by Bluetooth or something) this would also be helpful, as it is not a large amount messages. I tried to do it with Smart Switch, hoping it could somehow merge the messages from the two phones, but it would not sync messages. Maybe because the new phone already had a lot. Searching the internet I seemed only to find solutions for transferring everything from one phone to a new phone. Not the answer you're looking for? Browse other questions tagged samsung-galaxy-s-3 sms data-transfer mms samsung-galaxy-s7 or ask your own question. 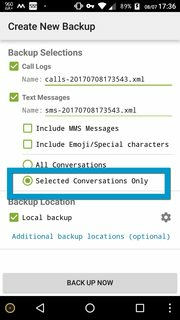 Can excessive text messages stored on phone cause issues? How to transfer both SIM and phone contacts to a new phone?